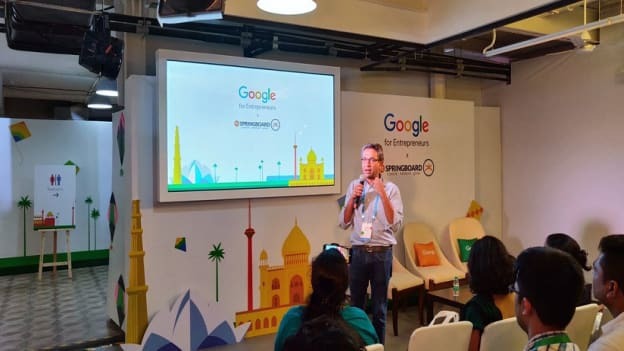 At the launch of the partnership between Google For Entrepreneurs and 91springboard, Rajan Anandan, VP, Southeast Asia and India, Google, threw light on Google's plans for startups and women entrepreneurs in India. ‘It’s an incredible time to be starting up in India,” stated Rajan Anandan, VP, Southeast Asia and India, Google. Rajan was speaking at the launch of the partnership between Google For Entrepreneurs and 91springboard and the opening of the Google for Entrepreneurs lounge at 91springboard’s flagship hub, located in New Delhi. Rajan’s exhilaration stemmed from the fact that India is now the third largest startup nation in the world. It is also the second largest Internet market in the world, which keeps on adding 10 Mn net smartphone users every month. No wonder entrepreneurs had never had it so good in the country before. Added to that, there has been an incredible sea change in the Indian startup ecosystem in the last 10-12 years. But Rajan and for that matter, Google believes that in many ways we are just getting started. Building a startup ecosystem in a country as big as India is like playing a test series of five matches, he reasoned. It’s not an IPL match. Given the Flipkart deal-India’s first mega exit- one can say that the first match has ended. In many ways, we are just starting the second match of a five-match series. Already at the end of the first match, we are the third largest startup ecosystem in the world. One can imagine where things are going to go from here. However, this second match is going to be different in many ways from the first match. A lot of startups going forward are now going to build for India 2.0 or India 3.0, as per Rajan. All the businesses created so far have focussed on India 1.0 or the first 100 Mn users. This next wave of consumers will lead to the formation of some of the biggest companies in India. The biggest companies get built by solving the biggest problem or capturing the biggest opportunity. And in a country like India, we don’t have a shortage of big problems. This is why Google created the ‘Solve For India’ program as it felt that the next wave of startups should solve for India. More so, when you solve big problems for India, you are essentially solving for 3 Bn-4 Bn people around the world. The Google Lounge aims to facilitate these entrepreneurs as they take the country’s startup ecosystem to the next level. The lounge is sponsored by Google for Entrepreneurs, which provides financial support and the best of Google's resources to dozens of co-working spaces and community programs across 135 countries. 91springboard will join Google for Entrepreneurs’ partner network, which has a global footprint of 50 partners and includes six Campuses (Google’s owned and operated space for entrepreneurs). 91springboard members will also have access to the Google for Entrepreneurs Passport program, which allows members of 91springboard to work from more than 35 Google partner spaces around the world. However what makes the partnership more exciting is that it combines the idea of solving for India with women entrepreneurs. With an aim to nurture India’s next generation of innovative female entrepreneurs, and empower them to build for the future, the partnership will drive one training program a month led by 91springboard in Tier II cities. These events are directly focused on educating and up-skilling female entrepreneurs over a period of two years, with 24 engagements planned across the country. The trainings will focus on honing leadership skills, running design sprints, fostering tech-focused discussions, and will include 1:1 mentorship for female entrepreneurs. But why is Google pushing women entrepreneurship? This is because declaring the ominous, Rajan believes that in the next 20 years, there are going to be fewer and fewer jobs. Which means, women also have no other option but to startup. Citing instances of successful women entrepreneurship in the country, Rajan stated that today, three of the leading content companies in India are being built by women. Come 2025, we will be looking at some of India’s biggest 40-50 unicorns, with 40%-50% of them being founded by women.